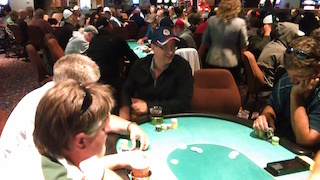 In the midst of battling breast cancer, 46-year-old Pamela Wilson took down the PPC 2015 Midwest Poker Classic. Earlier this month, the PPC Poker Tour visited Wisconsin for the first time. The 2015 Midwest Poker Classic at Ho-Chunk Gaming Wisconsin Dells, a $350 buy-in $50,000 guaranteed Main Event, attracted 333 entrants and created a prize pool of $85,248 plus $21,312 in PPC Aruba packages. While all of that shows the success of the stop, it was another story that grabbed headlines and touched hearts. In the midst of a battle with breast cancer, 46-year-old Pamela Wilson emerged as champion of the event to win $17,902 and a $5,000 PPC Aruba package. The money wasn't exactly life changing — though it was the biggest of her career — but Wilson's story certainly is. Born and raised outside of Toronto, Ontario, Canada, Wilson grew up in a European family; in fact, her mother was pregnant with her when they emigrated from Scotland in 1968. Wilson, a competitive swimmer growing up, often sat down for family game nights with her two older brothers, Brian and Iain, who're now a commodities trader in Chicago and journalist at Bloomberg News in Tokyo, respectively; as well as with her mom and dad, who're now retired down in St. Simons Island, Georgia. After graduating from McMaster University in Hamilton, Ontario, with a Bachelor of Arts in Economics, Wilson began a career in the tech industry, specifically the audio and web casting industry in VP Sales, Marketing & Operations roles. I got it checked out in February and was diagnosed with Stage 2 invasive Breast Cancer. "I'm also an entrepreneur," Wilson told PokerNews. "I built and sold my first company in that industry in the early 2000s. After I sold my company, I came up to Madison in 2007 to work at Sonic Foundry. That's the company my husband, Monty Schmidt, founded. That's where we met. We both retired from that industry and Sonic Foundry in 2011. We were married in 2012." It was around that time when Wilson learned to play poker, taught by her husband. Fittingly, Monty finished 12th in this same PPC Poker Tour Main Event that his wife won. "We love sharing this hobby together," admitted Wilson. "We love talking about how we would play hands differently, strategy, 'what if' scenarios. It brings us closer together. That is until the bad beats happen, and he usually puts them on me more. We do have a friendly competition, definitely not a rivalry. No one was prouder than he was of my win, and it would have been the same had the tables been turned." Her husband may have taught her the rules of poker, but Wilson refined her game thanks to a radio competition back in 2010. "At that time, Mark "P0ker H0" Kroon, Steve Verrett, and Mike "Wisco" Murray were hosting a local radio poker show," Wilson explained. "They ran an Ultimate Bet promotion inviting listeners to submit reasons why they wanted to improve their game, why they loved to play, and who of the hosts would be their favorite coach. Each of the hosts picked one of the lucky entrants, gave them $200 on UB, their coaching, and a month of time. Whoever had the most money at the end won." Wilson ended up being selected by Murray, who gave her lessons and immediately set about teaching her how to play online. It worked as Wilson shipped a $1 tournament for $1,000 the first week, and then used $330 of the prize money to enter a $50,000 guaranteed tournament, which she promptly shipped for $15,000. Needless to say, Wilson won the radio show promotion. In the years that followed, Wilson had some poker success. In September of 2012 she won the $100 six-max no-limit hold'em event at Reno's Fall Pot of Gold for $3,252, and in December of that year she placed 25th in the Mid-States Poker Tour Canterbury Park for $2,904. 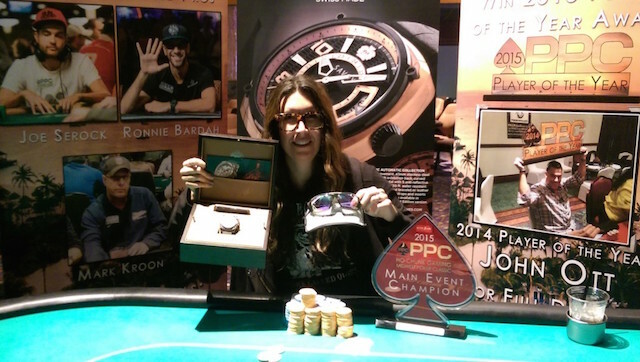 She also finished 13th in the 2014 PPC Aruba World Championship for $4,350. Unfortunately for Wilson, one month after returning from Aruba we she received the devastating news that she had breast cancer. "In January of this year I was experiencing some pain, and was feeling increasingly fatigued," said Wilson. "I got it checked out in February and was diagnosed with Stage 2 invasive Breast Cancer. It was a very scary time for Monty and myself when they originally found it in my lymph nodes, not knowing how far it had spread. "At that time we stopped everything. No poker, I closed up a boutique I had just opened, and decided to focus on my treatment and health. Since then I have been essentially full time in it, from surgery to two months of radiation. I still have steps to go but the hardest part is over." People viewed me as the underdog, and it's always fun to cheer for the underdog. Over the past six months, Wilson explained that she used a lot of her downtime to "think about, study, and figure out ways to adjust my game." That included studying the game of Vanessa Selbst, consuming coaching tutorials, and watching a lot of television poker. This allowed her to identify some of her leaks and adjust accordingly. 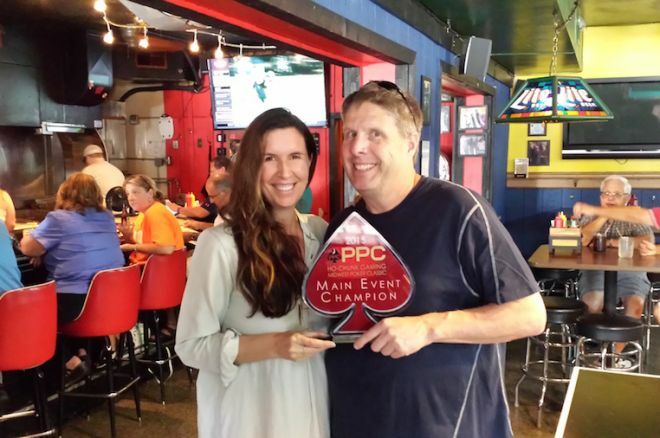 "The PPC Midwest Poker Classic was not only my very first tournament since I finished radiation, it this was the first time I'd been out of the house for a weekend since I was first diagnosed," said Wilson. "I was in a lot of pain and fatigue at the final two tables, but I just decided, 'I've got a shot, so whatever, I'll just deal.'" Deal she did. Wilson played a patient game, and she was rewarded at the final table with a rush of good cards, which allowed her to send numerous opponents to the rail. "It feels really great," Wilson said of the win. "I had so many people coming up to me saying 'I was cheering for you, I was hoping you would win'. I think with less than five percent of the field being women, people viewed me as the underdog, and it's always fun to cheer for the underdog! The Ho-Chunk poker room gals said I was their first woman champ. They were so happy. I know it sounds kind of corny but it makes me feel great for others to take something positive out of the results of my efforts." Wilson plans to split her prize money between her bankroll, shoes, and giving to charity. As for poker, she plans to travel to the Fall Poker Classic at Canterbury Park in Shakopee, Minnesota, in October before making the most of her package with a November trip to Aruba. "Until then, I will be getting healthy and strong, and playing a few locals tournaments and seeing my friends," Wilson added. "I love those games the most."